When Emma was eight years old, we took a family holiday to Egypt. Whilst I was applying sun cream, I felt a hard lump on her face, around her cheekbone. I wasn’t too concerned as she seemed okay and it wasn’t hurting her. When we returned, I took her to the doctor who suspected a blocked saliva gland. We took her to the dentist who referred us to maxillofacial. They weren’t sure what it was and so Emma had an ultrasound and an MRI. The MRI showed a growth but they were pretty sure it wasn’t anything serious. The consultant ordered a fine needle aspiration, just to be sure and then four days later, we received a call back. They told us they weren’t sure what it was but that it looked and acted like cancer. Our world came crashing down around us. Three days later, we went to see a paediatric oncologist at Royal Manchester Children’s Hospital who told us he suspected rhabdomyosarcoma, a soft tissue cancer. A week later, Emma had another biopsy and a central line fitted. The official diagnosis came three days later; it was alveolar rhabdomyosarcoma. A few days later, we took Emma for a bone scan to ensure there was no spread. We were lucky and had caught it early. Chemotherapy started two days later and meant a two-night stay in hospital for each round she received (nine in total). Part of her treatment involved an extra chemotherapy as part of a clinical trial. 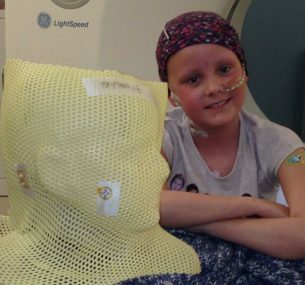 In January 2014, Emma had a nine-hour operation to remove the tumour, a three day chemo course and then we all flew to Oklahoma so that she could undergo Proton Beam Therapy courtesy of the NHS. 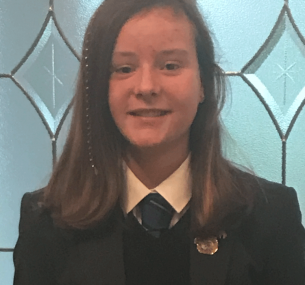 Apart from the usual ‘crashes’ between courses of chemotherapy, where she would need blood, platelets and sometimes antibiotics, Emma responded well to treatment. During our time in Oklahoma, we witnessed lots of patients ringing the bell after they’d completed their treatment. We couldn’t wait for Emma’s turn. On March 5, she had her last dose of Proton Beam Therapy and rang the end of treatment bell. We flew home on March 10 and looked forward to the day she would finish chemotherapy. We showed the bell to our nurses there and they agreed it was a fantastic idea. 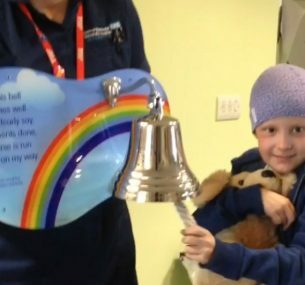 We had a bell made in time for Emma’s last chemo and she was the first to ring it at Manchester. She is now three and a half years out of treatment and doing well. She had a clear MRI and chest X-ray in September 2017. She loves school, dancing, singing and drawing. We have placed a further 131 bells into hospitals for other children and adults to ring when they complete their treatment. We are forever grateful to the wonderful staff who looked after her and continue to look after the warriors going through this. End of Treatment Bells are placed into hospitals for children and adults with cancer to ring after their gruelling treatment.